Instead of treating your heartburn symptoms, you can block it at the source with Prilosec OTC Acid Reducer Heartburn Medicine. Heartburn happens when excess acids reflux into your esophagus. 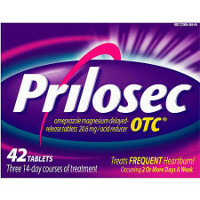 Prilosec Heartburn Medicine works by blocking acid production before it starts.